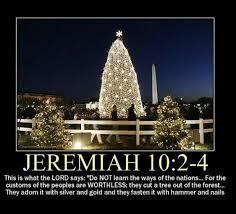 Where Did the christmas tree originate from? America, Babylon, Egypt, Rome….. The following demonstrates what the Babylonians believe about the origin of the Christmas tree: “An old Babylonian fable told of an evergreen tree which sprang out of a dead tree stump. The old stump symbolized the dead Nimrod, the new evergreen tree symbolized that Nimrod had come to life again in Tammuz! Among the Druids the oak was sacred, among the Egyptians it was the palm, and in Rome it was the fir, which was decorated with red berries during the Saturnalia!” (Walsh, Curiosities of Popular Customs, p. 242).